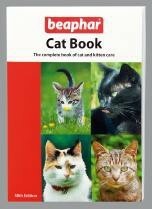 Beaphar Cat Book The Complete Book of Cat Care Perfect For Beginners Or As A Reference When Needed. Covers choosing a cat,breeding,caring for a new kitten.caring for an older cat,parasites and first aid. An inexpensive guide that is regulary updated with the latest findings. Contains money off vouchers for Beaphar Sherleys products. Regarded as the bible of cat care to many.